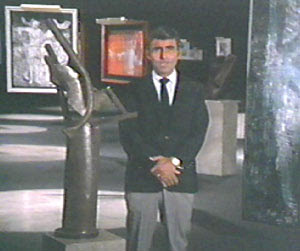 Although dwelling often in the shadow of the better-known The Twilight Zone (1959-1964), Rod Serling’s Night Gallery (1970-1973) offered quite a few masterpieces during its three-season run on network television. But today, I want to focus attention on a different Night Gallery favorite: “Camera Obscura.” The tale was adapted for TV by Rod Serling and based on a short story by Basil Copper. Viewed now, this creepy 1971 segment boasts a high degree of relevance to our contemporary era; the age of bail-outs, bubbles, and the Great Recession. Set in London during the early 20th century, “Camera Obscura’s” morality play depicts a prissy money-lender named Mr. Sharsted (Rene Auberjonois) as he makes a collection house call on a “shrewd old dog,” Mr. Gingold (Ross Martin). Gingold is an eccentric collector, and his loan – accumulating 13% interest – has come due. But Gingold wants to discuss something important with his creditor before he gets around to “payment.” Accordingly, he demonstrates for Mr. Sharsted an instrument called a camera obscura – a device consisting of prisms and lenses – that can view (and then broadcast…) the whole panorama of London on a circular table. In particular, Gingold focuses this arcane instrument’s lens on the image of a foreclosed home belonging to a 76-year old man. Sharsted charged the old man “injurious interest” on a loan and when the sick man couldn’t keep up with the mortgage payments, Sharsted re-possessed his house. “I charged the legal rate!” Sharsted insists. Gingold replies that “what is legal is not always just.” He bemoans Sharsted’s lack of humanity. But Sharsted remains unrepentant. He notes -- in signature Serling cadence -- that “humanity applies to funeral eulogies and Valentine cards,” but most assuredly not business. 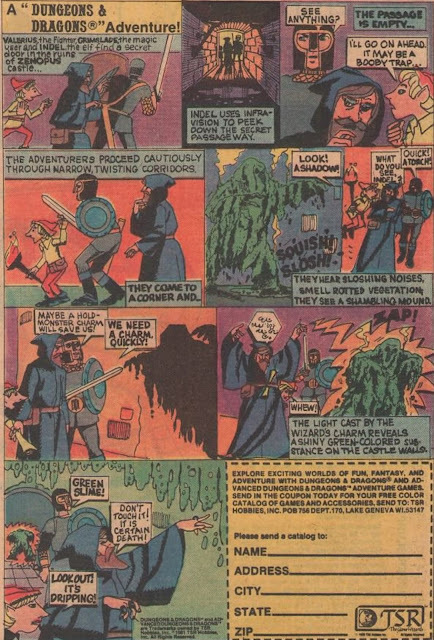 Realizing that Sharsted has irrevocably forsaken decency, Gingold utilizes an occult camera obscura (located in a secret chamber…) to exact moral payment from this emotionally-bankrupt money lender. He uses the instrument to trap Sharsted in a Dickensian-style personal Hell, one depicted in a green, lurid lighting scheme. This Stygian snare is the City of London as it existed in the 1890s. But more than that, it’s a twilight world populated by the greedy, the avaricious. The souls who congregate there have turned into monsters; their faces twisted by the greed and inhumanity they once carried only inside. Sharsted attempts to flee these creeps, but no matter where he turns…he ends up right back where he started. Director John Badham deploys slow-motion photography and jump cuts to visualize the idea of an inescapable Tartarus and the segment builds to a fever pitch. Rod Serling always boasted a real affinity for the “shadow people,” for the little guy who just couldn’t catch a break in an increasingly impersonal and heartless world. “Camera Obscura” is perfect material for the author since the outline of Copper’s story permits him to mete out cosmic justice against a man who preys on the weak, the desperate and the hopeless. As the script establishes, Sharsted “backs people into the corner of despair” and so richly deserves his nasty fate. As is noted above, “Camera Obscura” pointedly notes that what is “legal” is not always “just,” an argument that some people still don’t seem to get, even today. If the rich and powerful are the ones who lobby for laws, and Congress is in their pocket…then how, truly, can a society arrive at “just” and fair rules? In the news today, credit card company executives whine that laws favoring the consumer are unfair, or anti-business. We hear health insurance companies jabber about the terrors of the public option in health care, even as 46 million Americans (many of them children) go uninsured. We see price gouging at the pumps every holiday season, and then – inevitably – watch as gas companies brazenly announce record profits at the end of each quarter. Maybe Mr. Gingold needs to pay those folks a visit too. Come on guys: smile and say cheese for the camera (obscura…). Wish that this could be done to greedy bastards like Bernie Madoff, and most of the conservatives from the Reagan era onward who got America & the world into this mess with their policies. Vote Now in the 2009 Portal Awards!